Legend has it that 300 years ago a small Chinese village was terrorized by a beast from the mountains on the Eve of the Lunar New Year. Tired of the confinement to their homes that came with fearing the beast, the villagers created their own monster, made to look like a brightly colored lion. As New Year's Eve approached, two men maneuvered the man,made lion while the other villagers followed, beating on metal pots and pans to scare away the terrorizing beast. The retaliation worked, and the beast retreated back to the mountain, never to be seen again. The practice became custom, and soon began to symbolize chasing away the evil spirits of the old year and ushering in goodness for the New Year. Although practiced throughout the year at various events, lion dancing has become a main focus of many Chinese Lunar New Year festivals. While lion dancing takes on many forms today - folk custom, dance drama, and competition - it is the martial arts form that continues to entertain while imparting lessons of virtue. When portrayed by martial artists', the lion dance identifies survival and the balance of hardship and joy in life's lessons. Boston's Chinatown celebrates the Lunar New Year every year, and the lion dance is a spotlight of the celebration. The festivities begin with several processions, each led by guides carrying Chinese tapestries and flags, followed by a drum player and several musicians clanging brass symbols, who are then followed by at least a dozen lions dancing in succession. 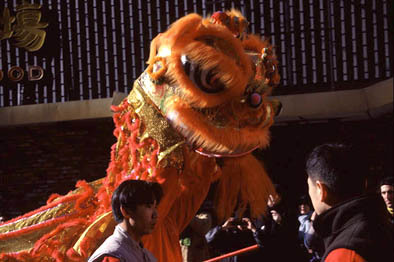 After speeches by local town and government officials, each lion travels the streets of Chinatown blessing restaurants and stores. Shop owners hang a head of lettuce from the doorway to symbolize prosperity, and the lion proceeds to 'eat' the lettuce from the string. After this, a series of red,stringed fireworks are set off, enveloping the buildings in smoke. Spectators toss oranges in the air as a life,giving symbol, and the processions are followed by martial arts demonstrations as well as youth groups singing songs.